My Mother is Bertha Florence Smith Murley. She passed from this mortal existence on September 14, 2009 at the age of 97 years, 3 months and 7 days. Bert, or Aunt Bert as many remember her, lived a long life, all of it in Arkansas, and almost all of it in Clay County. Burdened by various periods of ill health, she seemed determined to cheat the grim reaper to the very end. This narrative is my attempt to document her life from my perspective as her first born and her only son. I do this to help her progeny to have better insight into her life and the history of the time period in which she lived. So many times we look at past loved ones and see inanimate pictures of people dressed differently than we dress and in surroundings unfamiliar to our eyes. I hope this will make it easier to see mom as a real person no different than we are in our time period. 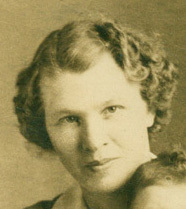 Mom was born the first child of William Andy and Emma Jane Hartwick Smith. She was born on June 7, 1912, near Clinton, in Van Buren County, Arkansas. This area was primarily a small farming community. In 1840 a cotton gin was built there powered by a team of oxen. It had the capability of removing the seed from 400 lbs of cotton a day. I’m sure that by 1912 progress had been made in that effort, indeed I remember her talking of this community and I actually visited the community as a young boy. 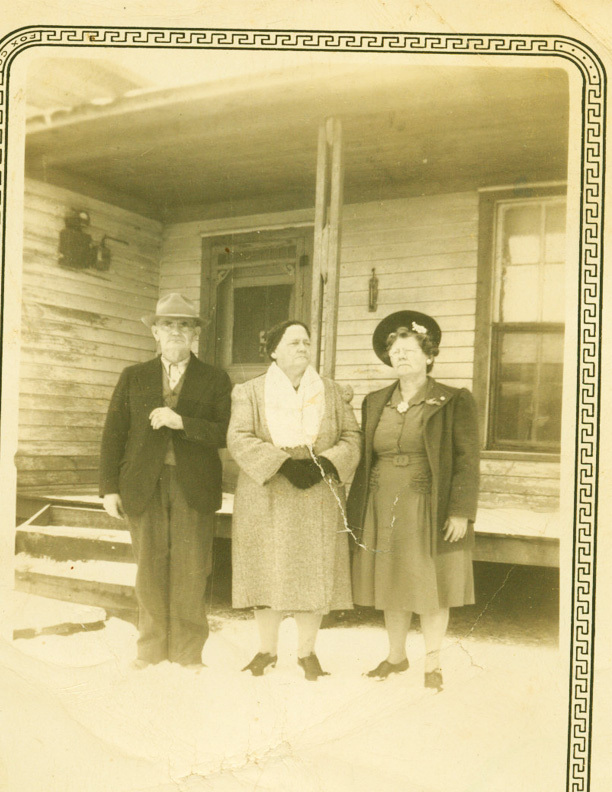 They lived in Fingertown, so named because a man had lost his finger in a cotton gin there. Her parents, W.A. and Emma, were cotton farmers. Uncle Will, as my grandfather was called, was a religious man, always involved in church work. 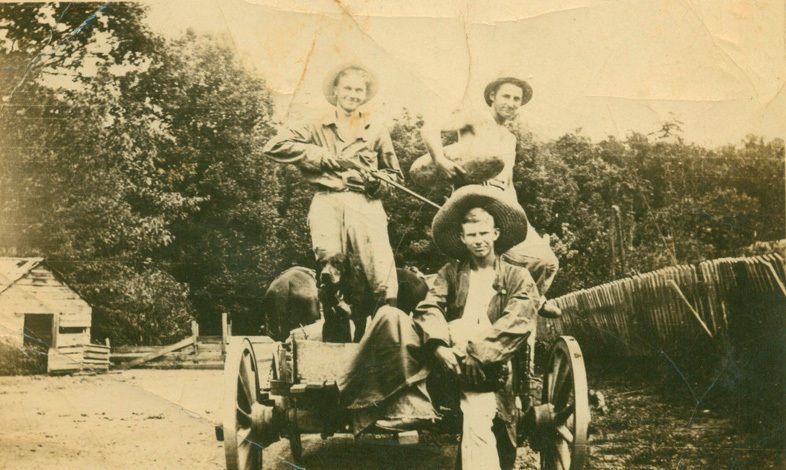 His father Henry Smith was a Methodist circuit rider in that community. 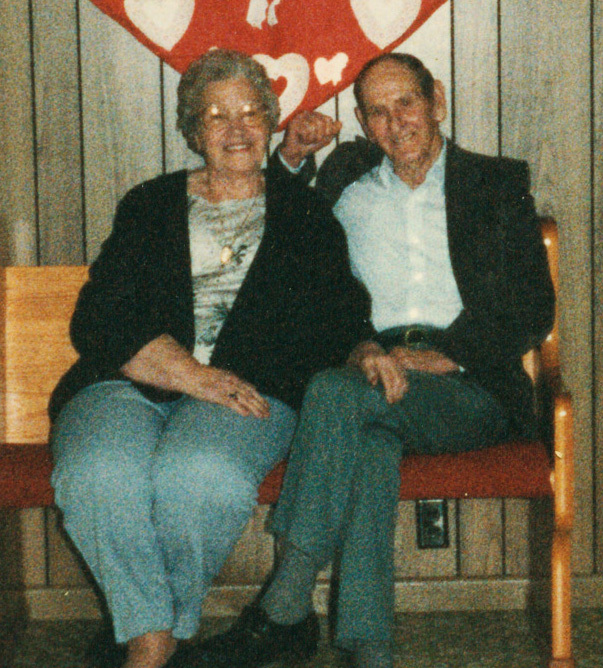 The family, including mom, were always involved in a community church their entire lives. Mom told some stories of her early childhood there, one of which was remembrances of her father riding her across a creek to get to school on the back of a mule. Sometimes the creek was deep enough the mule would have to swim. 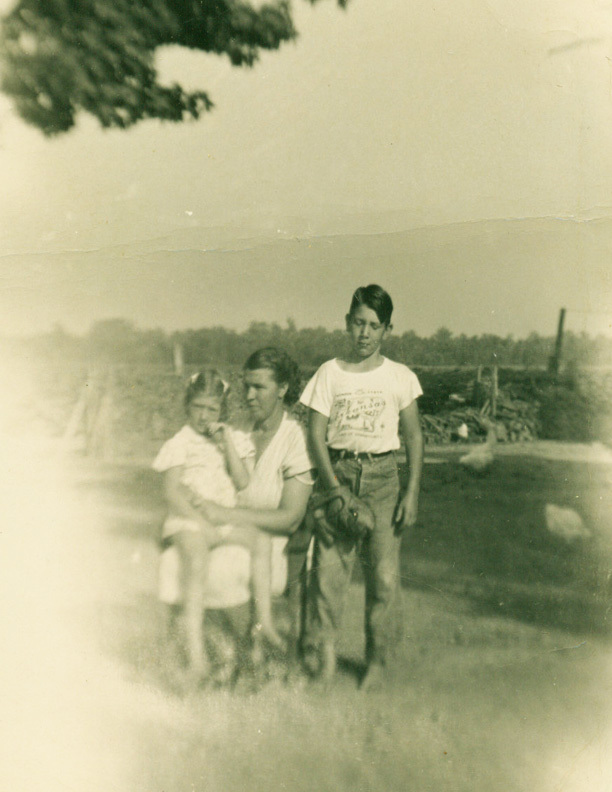 I have listened to my mom and Aunt Jean reminisce many times about the good times around Greenway and growing up there. Later on, as a teenager, she would play girls basketball on the Greenway High School team. Indeed, she always enjoyed basketball as a spectator sport as well. And when I was in High School, she would often attend the games. I only have one picture of a young Bertha, taken when she was about 16. I have no idea who took the picture, or where, I wish there were more! I have always wondered what she was reading, as a small smile plays on her lips. 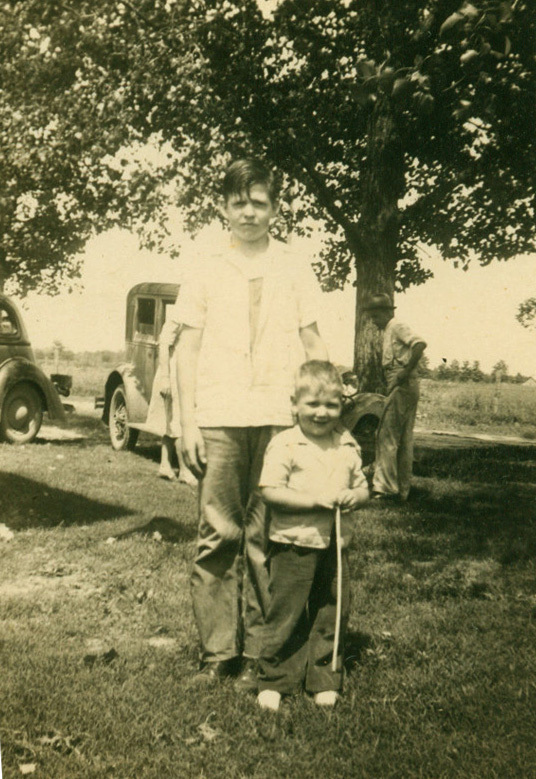 In the mid 1920’s another brother comes along, my favorite, Uncle Bill. He himself a teenage boy when I arrived on the scene several years later. 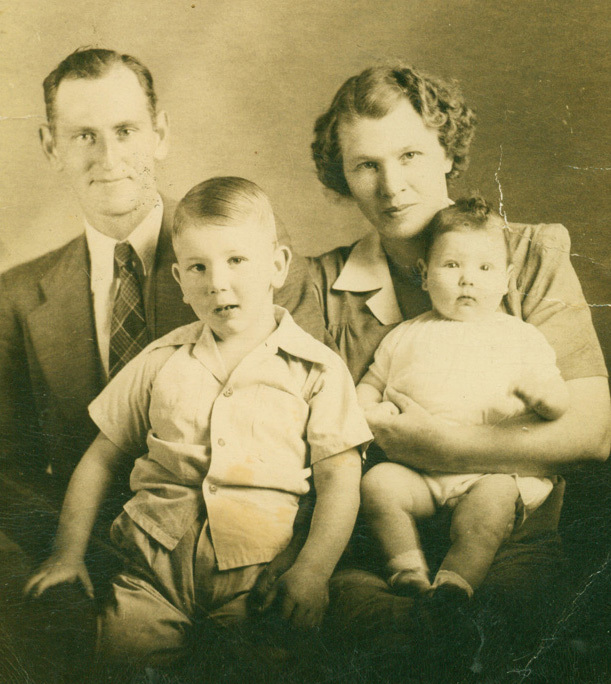 Now we have Bert and Berlon, then Jean , and then Bill the baby. 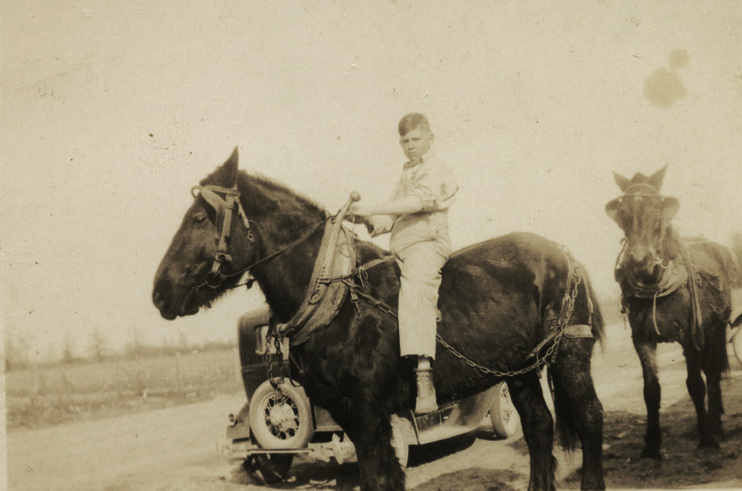 And Uncle Bill again, on the back of one of the many draft horses we always had. 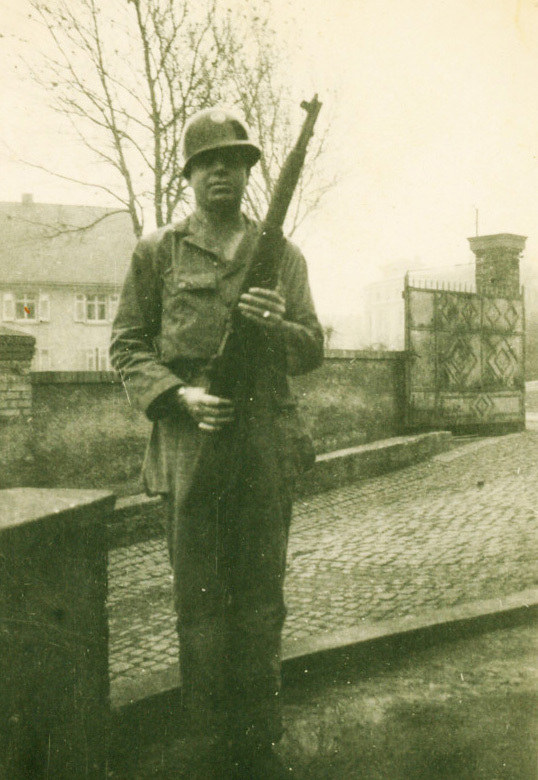 Mom grew up in the teens and twenties of the 20th century and matured in to the 30’s in which time America had fought a bloody war in France and Germany during the late teens. In 1912, when she was born, air travel was in its infancy. Probably 95 % of the roads in the USA were unpaved. Most houses in her community probably didn’t have running water in them and almost all had the famed outhouse out back. Most homes were lighted by lamplight. Indeed, only the well-off had electricity of the simplest form. As she matured she saw automobiles start to be used, farm tractors into the forties started to replace horses and mules. One went to the store to buy basics like sugar, flour, salt coffee, tobacco or cigarettes for the men. You raised your own vegetables and canned them for the off season. You raised chickens and ducks and geese for their eggs and for their meat. In the cold season you slaughtered your hogs or beef and smoked or cured the meat. It was necessary to grow up learning to plan your substenance. Mom learned that lesson well. Setting at a table she had prepared was always delightful, and all the way up to the time that she reached the point at which she became unable to prepare it, her freezer was always full. She always had family foremost in her mind. Her Uncle Martin was a soldier in WWI. She would often visit Uncle John and Aunt Eve and Aunt Ludie and her cousin Fannie. There were others of the Hartwick family as well, most of whom I only vaguely remember, like Carl and Maxine. 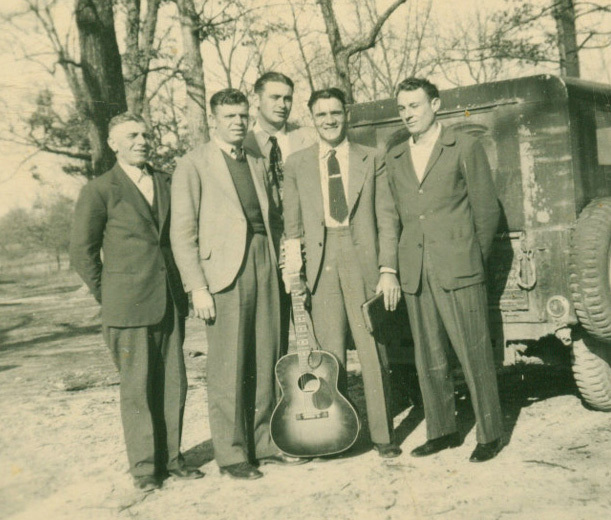 In about 1929 a young man moved to NE Arkansas from Mississippi by the name of. Clavis Wilson Murley. He is the young man holding the watermelon. No the costumes weren’t for props. That is the way they looked, the horses were real, too. You used them like automobiles and ATV’s and they would also double as lawnmowers. 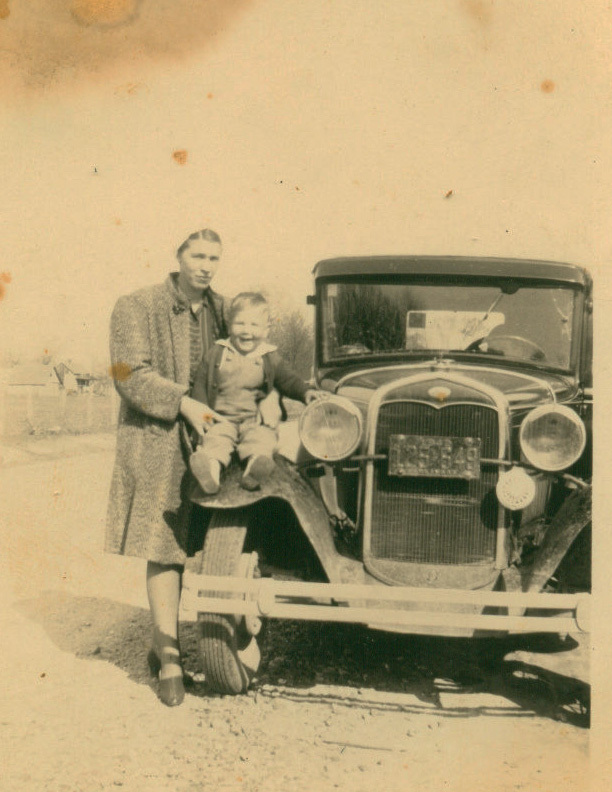 After mom graduated High School she worked for a prominent dentist in Kennett, Missouri. She lived in their home with the dentist and his family. I don’t exactly know what her duties were but I do know she enjoyed it by remarks she would make of that time of her life later on. 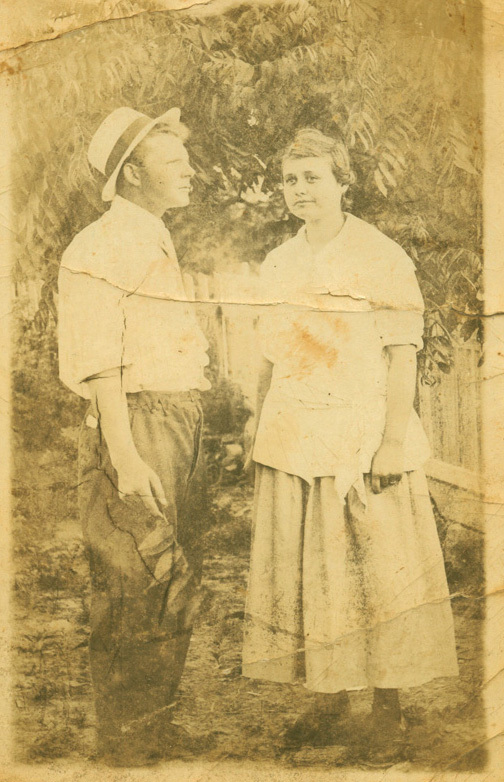 Some where around 1933 or ‘34, she said one night she was walking either on the way to or home from church ( probably known as Call’s Chapel) when a dashing young man rode up on horse back and swept her heart away. Everyone else being afoot, the young man on horseback made quite an impression on her. She spent the next 65 years with him. They worked together farming, sharing the chores of a family farm, they made decisions together, they picked blackberries to can in the spring to make jellies and jams. They picked “poke salat” to can for greens, and every spring 200 baby chicks would arrive to take their place in the pantry or for Sunday dinner as needed. Dad and his father were beekeepers, so there was always quart and larger jars of honey and honeycomb in the storm cellar (oh yes, nearly everyone had one). And late in the fall, we would go into the woods and pick up large bags of hickory nuts. Evenings would be spent (in that dark era before TV and video games) cracking and picking the meats from them to make cookies and candy. We would probably listen to the radio as we worked. The early part of Bert’s life was probably spent devoid of those pleasures. No radio, no TV, no refrigerator. No washing machine or dish washer. Probably no water in the house, unless a water pump was driven or dug on the back porch,. Most usually that was not the case. If nature motivated you in the middle of the night, it was out the back door and down the path. It mattered not if it was a moonlight summer night or 15 degrees and blowing snow or lightning and thundering. Houses were usually (at least in mom’s community) heated with wood or coal in some cases. Meals were cooked on wood stoves as well. Mom got her first refrigerator (a Kelvinator) about 1951 and I believe a gas range about then as well. Women’s lives were pretty difficult most of her life, at least the first half of it. There were many break throughs in the 1950’s, with many new technologies for the home. Within a few years there were washers, dryers, ranges, refrigerators, toasters, sweepers, etc. Mom had very little of any of these conveniences during her young years and raising a family, plus the average day was spent with feeding and caring for chickens, collecting eggs, tending to a garden - most of it done with hand tools - among many of the chores to be found around a family farm of that period. In the time long, long ago before Doppler radar, people didn’t have early storm warnings. Dad, and I’m sure other dads, would watch skies during stormy times. Sometimes in the middle of the night you would feel mom’s arms scoop you up out of your bed and quickly wrap you up and run through the storm to the storm cellar, then down inside. Right away your nose is assailed with the smells of wet earth and timber, of aging potatoes and onions stored for food. Dad would shut the door and someone would light a kerosene lantern, adding its smoky oily scent to the others of the room. When the storm was over, it was back into the house and back to bed. Again, I feel that her feelings and desires centered around family and the duties of attending to their needs, and of by staying close with them. That is the way she was after I came along. I see no reason to believe she would have been otherwise before. 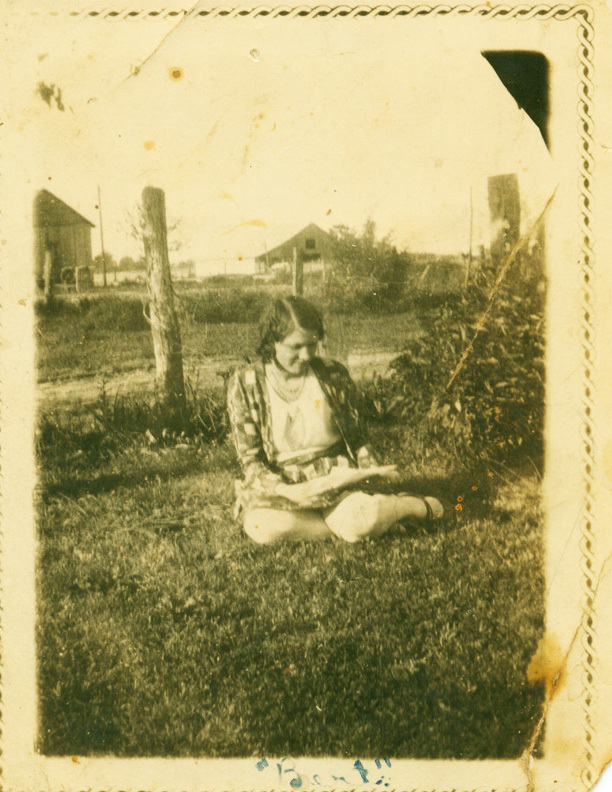 On January 8, 1936, in Greenway, at the age of 24, Bertha Florence Smith became Bertha Florence Murley. 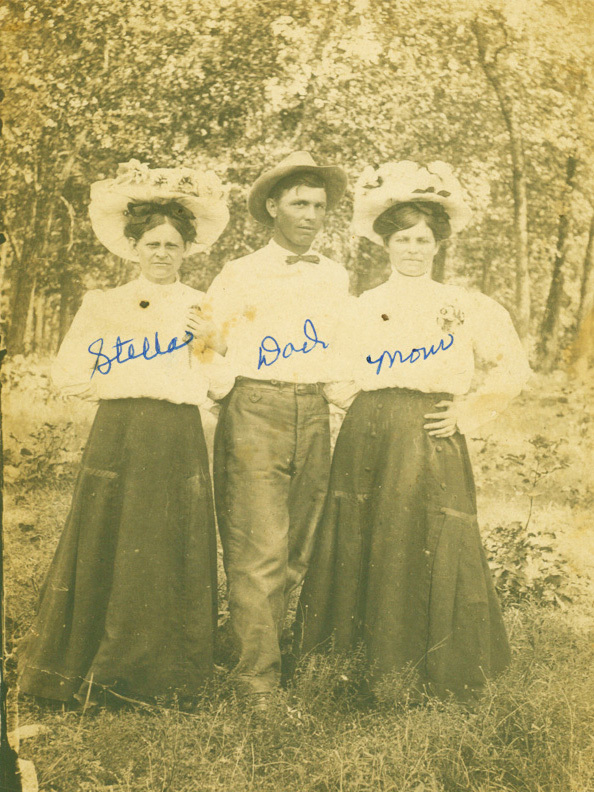 I am not too sure of the timeline on this part, but sometime after getting married and before I was born they moved to a property a few miles southeast of Piggott, Clay Co. Arkansas, and lived with my dads parents C.C. and Minnie Murley. The place was owned by Paul M. Phieffer, whose daughter Pauline was married to the famous novelist Earnest Hemmingway. 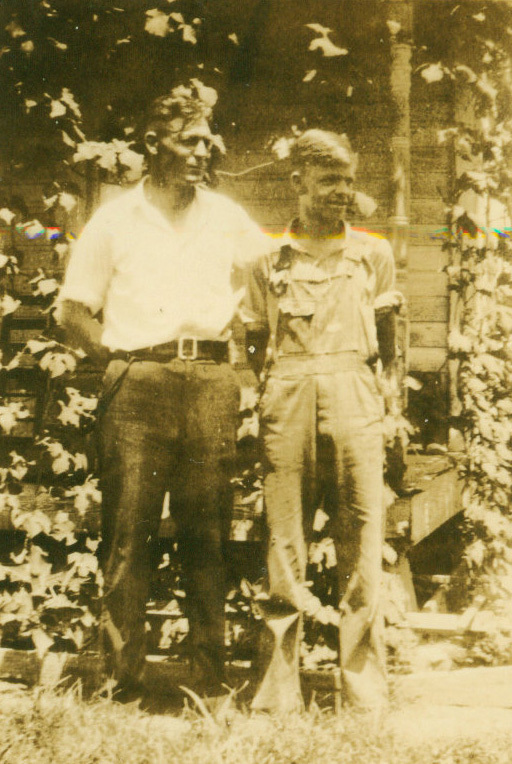 I know that dad had indeed hunted in the swampy east Arkansas Mississippi delta with Hemmingway, so I am pretty sure mom knew Hemmingway as well. lifetime started. I had to have been very young, but I remember the night at the train station in Piggott, when she said goodbye to her brother Berlon as he left for the war. 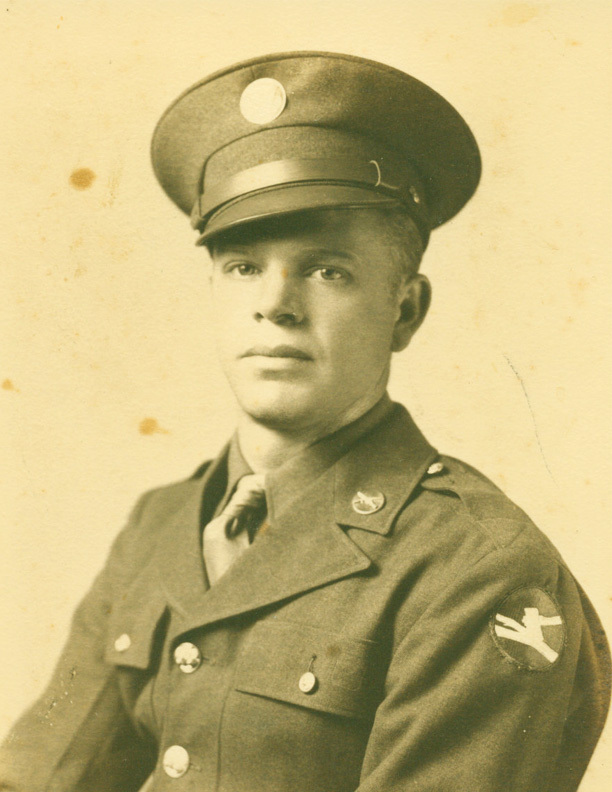 Uncle Berlon Smith went through most of the war in Germany. He was at the Battle of the Bulge and was in Berlin when it fell. I also remember her excitement when he came home. 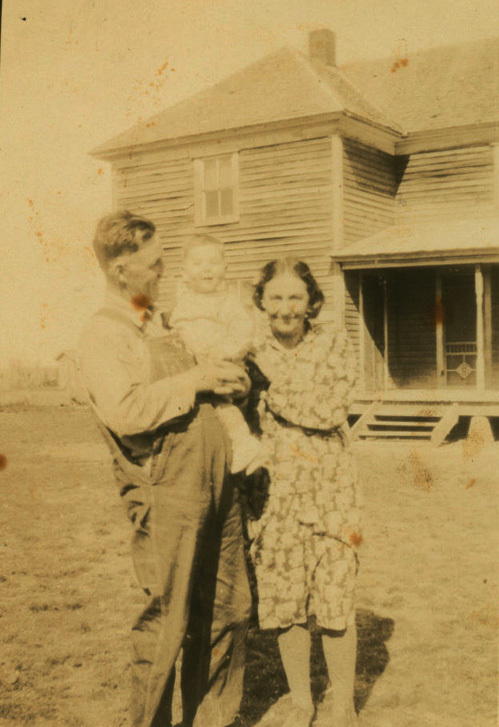 During the war, I remember we were living on the Jerry Taylor farm north east of Pollard, Arkansas, again, with my paternal grandparents. On a particular rainy day Mom and I were returning from Pollard. The roads were slippery and the same little 36 Ford that appears in the photo above slid off into the ditch and was almost lying on its side. Mom got me out and carried me the last mile or so home. Sometimes I would go with her to pick up hired field hands (cotton choppers). They got paid a whole $3.00 per day for a 10 hour day. She would zoom around the back county shady roads as if she was Bonnie of the Bonnie and Clyde duo. Mom was a good driver back then though. In October of 1944, my sister, Carolyn Jean was born. And the Murley Family was complete. WWII was not yet over. Many of us growing up and being parents have had times of adversity and still do. But raising children and sustaining a family was difficult in the forties. Things we take for granted more or less now was often difficult – sometimes impossible - to obtain. Sugar, coffee, gasoline, rubber, and probably lots of other items that I can’t remember, but for the most part the country was united in a common effort and a common cause. Mom always insisted on church and school and we were taught respect for our grandparents and others in general, and Dad worked. Oh my, he worked! I learned from them to never take anything for granted, that you had to work for what you would have, and their example was well set. But there were good times too. The family - and sometimes neighborhood - fishing trips. Several families would get together and go seine local bodies of water for fish and we would have fish fries on the bank of the stream. Sometimes catching hundreds of pounds of fish, nothing was wasted. What wasn’t consumed on the spot after being cooked in huge black wash kettles would be taken home and pressure cooked for later. Kids could run and play and get in the water and get wet and play in the mud and life was good. There was always the home for the holidays as well. It seems like most people went to their moms. I think as time went on it became a tradition to go to Aunt Bert’s and Uncle Pegs (what they called my dad). 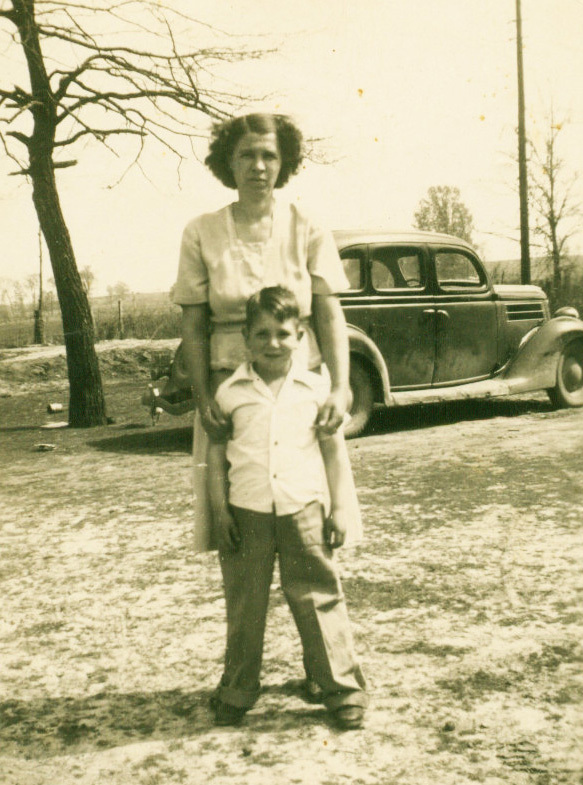 In January 1947, mom’s mother passed away after a long bout with breast cancer. Technology being what it was at the time, little could be done. I remember it as being a lingering, painful process. As children we were spirited away to Grandma Murley's house. and stepped out, and down the hillside she went! Dad got the car stopped and came running back to find us. Other than being peeled up and skinned and bruised, I was ok. Mom, on the other hand, had knocked her shoulder out of socket and bruised herself up pretty good. But her concern was not for herself, but for my welfare. 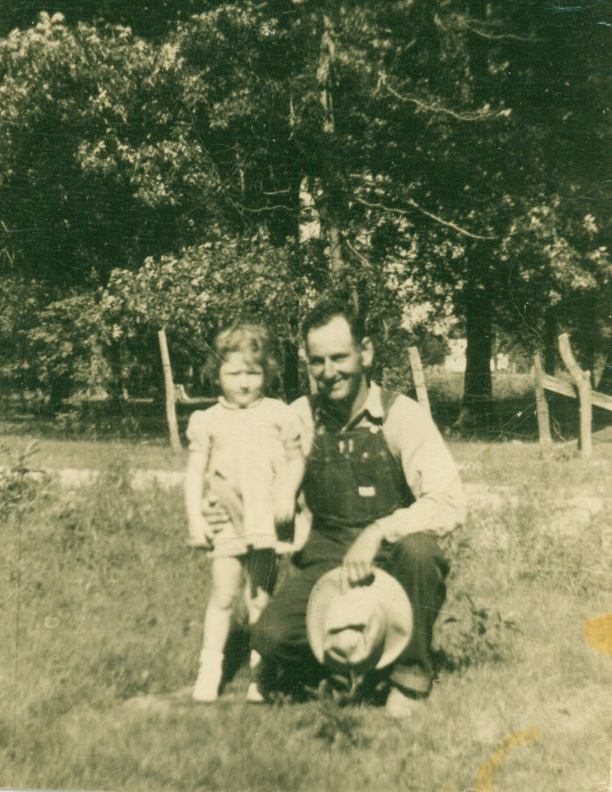 Somewhere in late 1949 we moved to another farm just west of McDougall and about 9 miles east of Corning in the western district of Clay County. 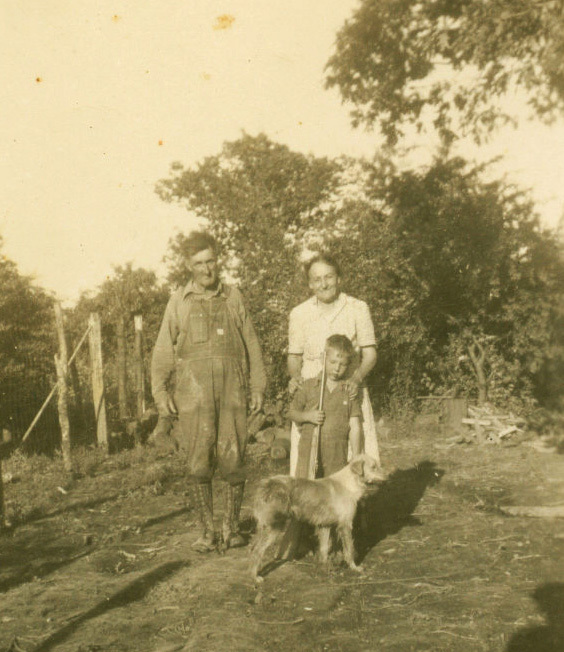 About 3 years later, she and Dad bought the farm across the road from a neighbor, Harrison Hays. Now for the first time in her life, she had her own home. 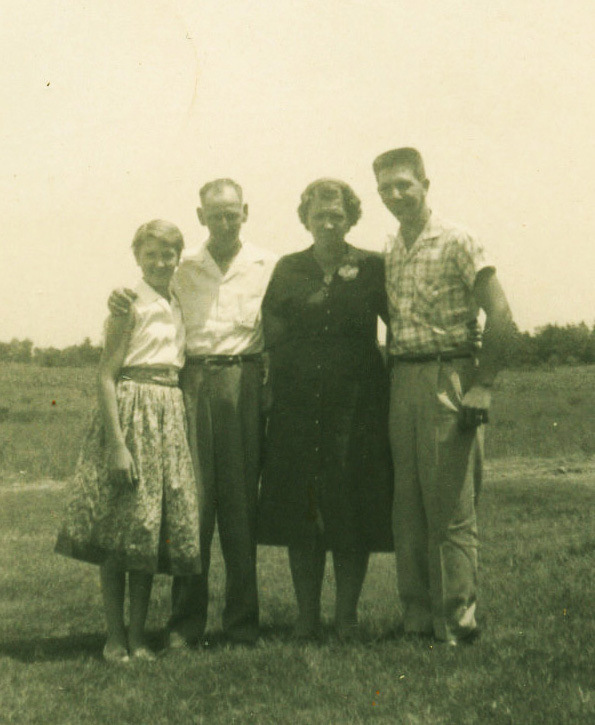 This is the family in our front yard about 1955 or 56. 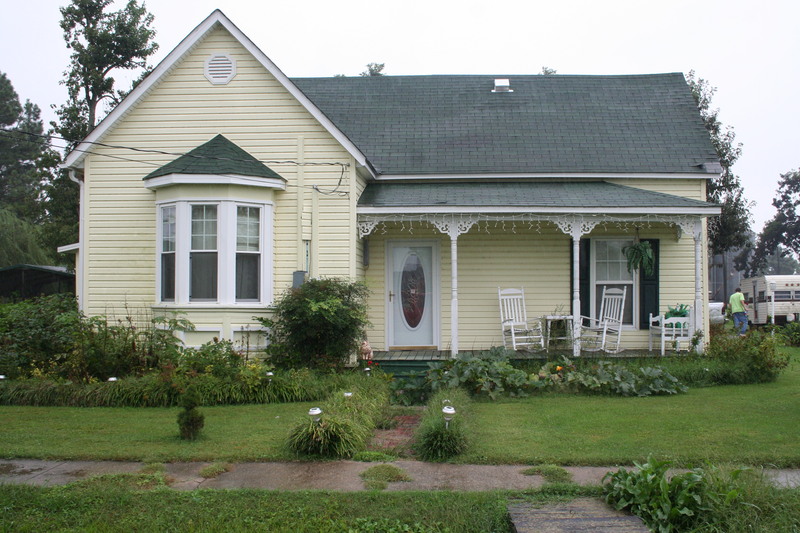 I can remember how we all enjoyed the simple farm house that was our own. 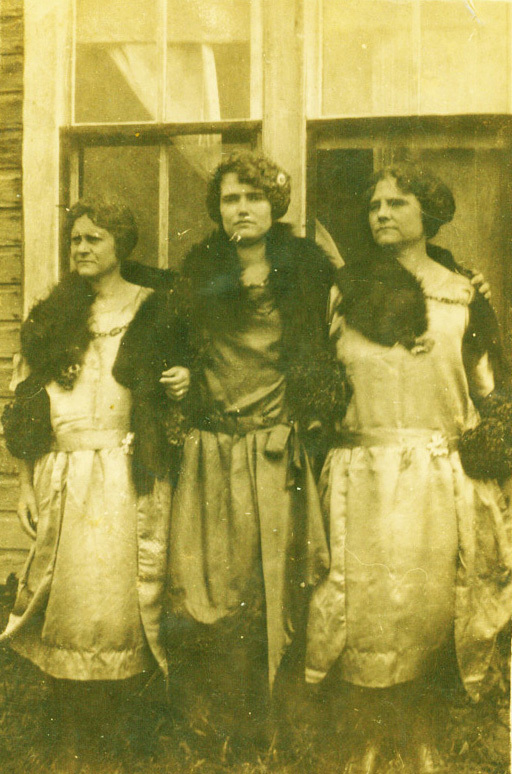 Grandma Murley came to stay with Sis and I while Mom went to St. Louis, Missouri and underwent radical mastectomy. Her recovery took a long time and she had to go for checkups every several months. Twenty-five years later, cancer again appeared, this time in her left breast, and it too was removed. Being the person she was though, she always pulled her weight in farm duties and caring for her home. In years to come she would have other medical problems that continued to follow her for the next 50 years. In 1962 her first grandson, Kevin Todd Murley, came along and 1965 her first granddaughter, Michelle Lynn Murley, arrived. And in October of 1966 her second granddaughter Jamie LaRue, was born. Life often brings equal parts joy and sadness to our lives. The great philosophers tell us it is to enable us to know one from the other. How can we know joy without having suffered sorrow? What would life be without death? 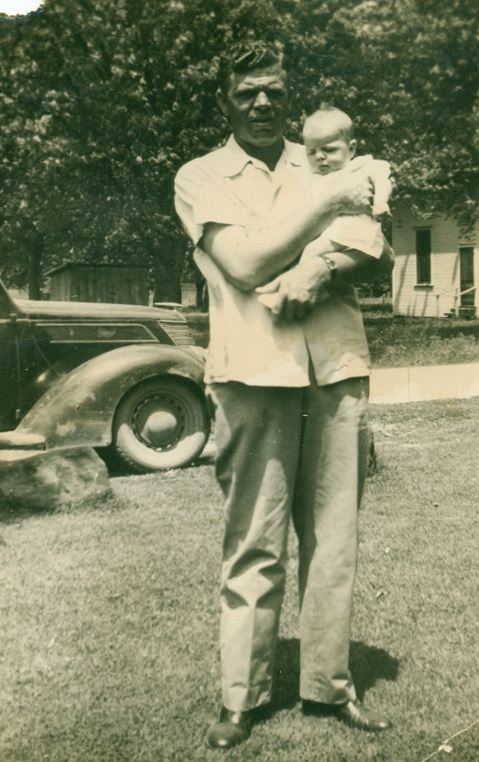 In 1969, her brother Berlon, a veteran of WWII, died suddenly of heart failure. Then, in 1970, her father, “Uncle Will” , W.A. Smith passed away. 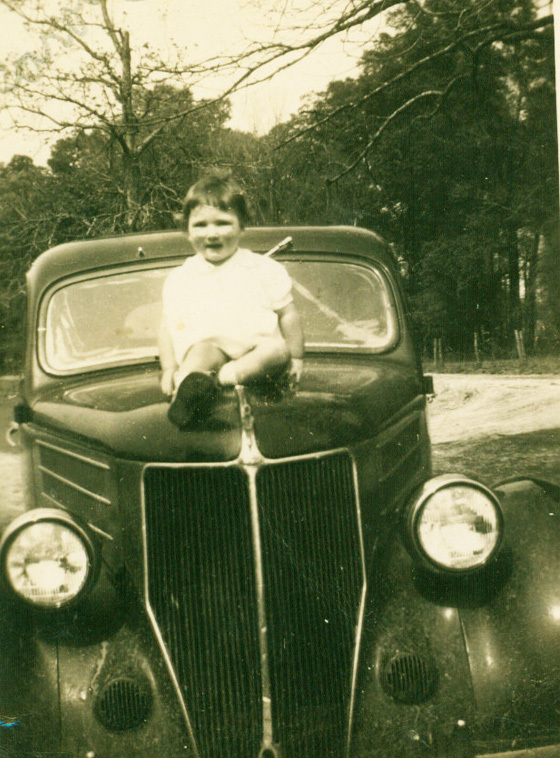 Just before the end of the 20th Century, she lost her daughter - my sister - Carol Wheat. Then, within 4 years, Dad, her companion of 65 years departed. She continued to live alone until 2008, when, just 7 days before her 96th birthday, she had to move to a nursing home, where she lived for another 15 months. We should remember Bertha Murley for her strength and endurance - just living for 97 years! Being born at the start of one century as the world shook off the previous century and moved into a great period of cultural, economic, technological and environmental growth and activity. Great turmoil of wars, great advances in communication. From horses to cars and planes, and even more advances in both to space and the moon. To radio and then TV, to computers and cell phones. The vast changes in her life are staggering, but for the most part she kept up with a certain degree of technology. She loved her TV and the basketball and baseball games. Remember her for her steadfastness in her ideals. Remember her for she is the end of an era, which you might have just been able to experience through her. Bertha Florence Smith Murley - Mother, Grandmother, Aunt Bert - was the daughter of William Andy Smith and Emma Jane Hartwick and proceeding up her paternal side was the granddaughter of Henry Smith and Jane McAllister. She was the great-granddaughter of John Carroll Smith and Catherine Bradley. Catherine, after the death of John Carroll, moved her father, Anselem Bradley, and her family to Van Buren County, Arkansas. Catherine was the grand-daughter of the famed Revolutionary War Hero of the battle of King’s Mountain Andrew Hampton. And the great-great-granddaughter of John Smith of Virginia and Susan of North Carolina. This is not all of her history, as there were the McAllisters and the Hartwicks and the Bradleys and the Griggs and the Douglas families and other lines too numerous to mention, each one taking their proper place in history. All their talents and history is passed down to each of us and we each make an impact on others and on our families, just as mom - Aunt Bert - did to us. I know I have left many things out of this narrative, that it is very incomplete, and that each of us have our own remembrances of her, our own stories about her. If you do, share them. The great thing about history is that it can be added to from other perspectives. Because you were her family.